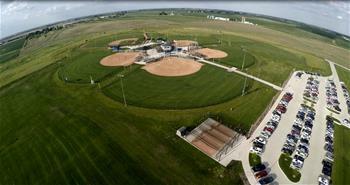 The Pella Sports Park is a 105 acre facility that currently includes 5 tournament (lighted) baseball/softball fields with permanent fences. The facility also has multi-purpose green spaces available to facilitate multiple fields for soccer, football, cricket, etc. The complex has a full service concession stand, restroom facility, PA system, scoreboards for the baseball/softball fields and two playgrounds. Fields are available on a first come/first serve basis outside of reserved usage. Fields marked as reserved are not available for use. Field 1 (Babe Ruth): 350’ center field fence, 300’ sides. 80’ or 90’ base lengths. Grass infield. Fields 4 & 5: 275’ center field fence, 250’ sides, 50', 60', 65', 70', 80' base lengths. Currently, there is approximately 10 acres of multipurpose athletic turf green space located to the south of the paved parking lot. At different times throughout the season this will be used for baseball, soccer, cricket or general use. Restrooms and playground are located in this area as well. Additional green space is available to the east and west of the current ball fields (Fields 6,7,8, and 9). Parking is only allowed on hard surfaces at the complex. No vehicles are allowed on the fields, grassy areas, gravel or walkways. Parking is also not allowed on the entrance drive. The Pella Sports Park is located at 393 Baseline Drive. From Highway 163 (traveling east or west), use exit 44, head north on Adams Ave, turn left onto Old Highway 163 proceed west for .3 miles. The Sports Park entrance drive will be on the right. Pets/animals, shelled nuts including sunflower seeds/peanuts, grilling, alcoholic beverages, smoking and weapons are prohibited at the Pella Sports Park. See the full Rules and Regulations for additional information. This complex is made possible through a partnership between the City of Pella, Fields for Our Future and many generous contributors. The project broke ground in the fall of 2013 and opened in the spring of 2016.